A strange year for pop music. Just because a song happens to be listed here, does not mean that it qualifies for inclusion in the pop history songbook. A quick glance through the above list reveals some oddly forgettable tunes. “Songbird” by the great Barbra Streisand was extremely successful at the time, reaching #1 on the Adult Contemporary charts. Can you hum a few bars? Neither could we. How about Barry Manilow’s huge sellers “Can’t Smile Without You” and “Even Now” which both topped various charts? Try to sing one, then the other, and see if you can tell the difference. Neither could we. The fact that such remarkable performers could create and succeed with such mindless drivel really does support the “musical wasteland” theory. But if you need further proof, scroll through the roster until you find Al Stewart’s “Time Passages.” If ever a song deserved to be a tomato soup jingle, this is it. Yet somehow this monument to mediocrity topped the AC charts for more than a month — probably because everything else was even more dreadful. What wasn’t dreadful was the aforementioned contributions of the Gibb family. Fortunately “Baby Come Back” was shipped off to musical oblivion when the Bee Gees returned in February with “Stayin’ Alive,” which spent four weeks at #1 until it was displaced by brother Andy Gibb with “Thicker than Water” for a couple of weeks in March. Keeping it in the family, the older brothers kicked Andy off with “Night Fever,” which spent 8 weeks on top. That tune finally gave way to “If I Can’t Have You” performed by Yvonne Elliman, written by — you guessed it — Barry, Robin & Maurice Gibb. So if you’re keeping score, The Bee Gees and their music essentially dominated the charts from January through mid-May of 1978. Big brother Barry had a hand in all of the #1 songs for 16 of 19 weeks during that run. 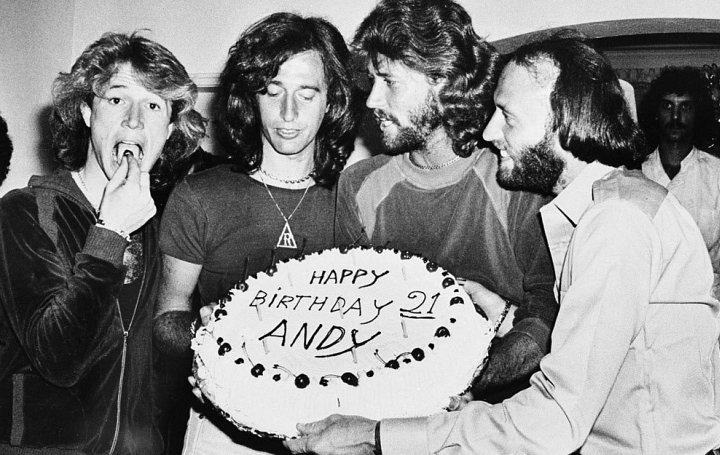 Fast forward another month and in mid June young Andy Gibb topped the charts again with “Shadow Dancing,” also written by Barry, Maurice, Robin etc. etc. seven weeks etc. Now we have the eldest brother cashing checks from the number one song for 23 of the first 30 weeks of 1978, finally edged out by the Rolling Stones’ “Miss You” at the beginning of August. Barry returned to the top spot at the end of the month, having written the smash hit “Grease” for Robert Stigwood’s hit movie of the same name. With Frankie Valli on lead, Barry on backing vocals, and an uncredited Peter Frampton playing guitar, it’s easy to understand how the song rose above the usual 1978 drivel. Since we’re on the subject of guitarists, back up to Andy Gibb’s hit “(Love Is) Thicker Than Water,” which was actually recorded two years earlier in Miami. Lead guitar on that session was none other than Joe Walsh. It also underscores how the Gibb brothers created a vibrant and successful music scene in Florida throughout the 1970s. That Florida scene is part of the explanation as to how a family from Australia can be considered such an integral part of American popular song. Aside from this remarkable run by the Gibbs, there isn’t much else to talk about in terms of American pop music in 1978. There are a few gems nestled in the list above that will likely stand the test of time, among them are “You Needed Me” by Anne Murray, “My Life” by Billy Joel, and “Don’t it Make My Brown Eyes Blue” by Crystal Gayle. Most of the rest are either dreadful, or simply haven’t withstood the test of time very well. “You Don’t Bring Me Flowers” is arguably the most notable in this category; hard to believe that a monster hit by pop legends Neil Diamond and Barbra Streisand would be largely forgotten just forty years later — receiving less airplay today than The Chipmunks recording even twenty years earlier. Another interesting note for pages of the Great American Songbook is Rod Stewart’s “You’re In My Heart (The Final Acclaim).” This effort was rather schmaltzy considering Rod the Mod’s 1977 success with the rocker “Hot Legs.” Surprising then, but considering his late career success with pop standards, turned out to be a glimpse of the future. Other notes include “Too Much, Too Little, Too Late,” a number-one smash for the duet of Johnny Mathis and Deniece Williams. Barring some remarkable comeback, it remains Mathis’ final appearance in the top 40. And in case you weren’t aware of it, Donna Summer’s recording of “MacArthur Park” marked the third time this cryptic tune hit #1. The first of course was Richard Harris’ original; the second was a recording by Waylon Jennings that topped the country charts. If you’re wondering why a number one song isn’t listed higher on the chart above, please keep in mind that this list reflects the lasting popularity and influence of a given recording, rather than its popularity in 1978. Summer’s “Last Dance,” for example, didn’t sell nearly as many records as her rendition of “MacArthur Park,” but it remains a radio and party staple decades later.